It’s the second largest coin hoard ever found in Britain — the first was 54,912 coins found in 1978 — and our hero is yet again an amateur metal detectorist who not only found this huge pot crammed full of Roman coins from the 3rd century, but who had the presence of mind not to unearth the pot when he realized it was under the top coins. Dave Crisp stopped what he was doing and called in the experts. After his metal detector gave a “funny signal”, Mr Crisp says he dug down 14in before he found what had caused it. 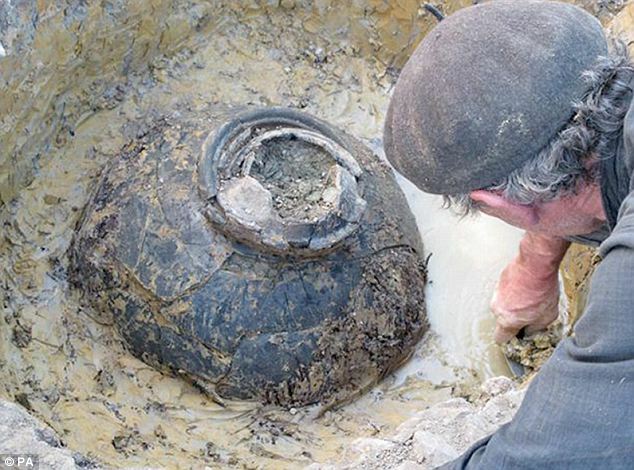 Archaeologists excavated the pot itself, so they were able to keep the 2′ tall vessel intact and to pinpoint the different layers of coins. This information upends a key assumption about coin hoards: that they were buried for later recovery by people fleeing conflict. 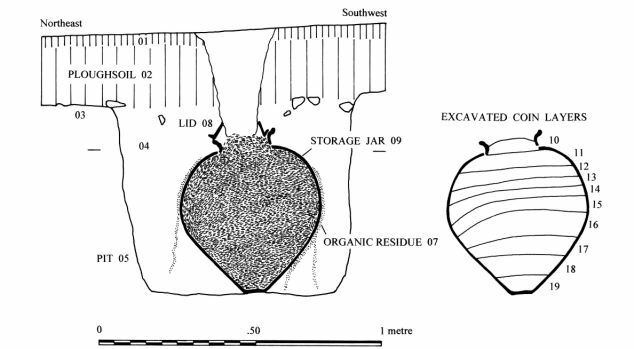 The layers suggest instead that the community added to the pot at regular intervals, possibly making votive offerings to the gods. 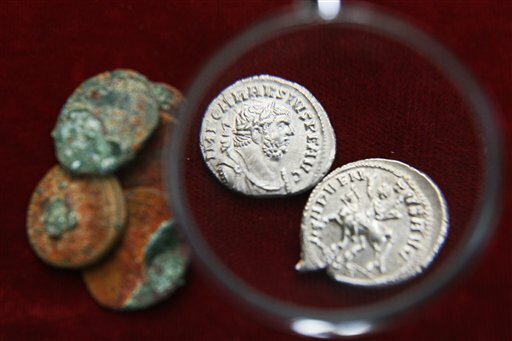 The hoard also includes 760 Carausius coins, the largest group from the reign of this separatist local emperor. Among them are 5 silver denarii, the only silver denarii being struck at that time anywhere in the Roman Empire. Carausius was a naval commander who usurped power in Britain and northern Gaul in 286. He ruled until 293 when his finance minister assassinated him and seized power for 3 years until Rome got Britain back. The hoard is now at the British Museum where experts will evaluate it. Assuming it’s declared treasure (which it will be), the Museum of Somerset will pay fair market value and Dave Crisp and the property owner will get to divide the money.